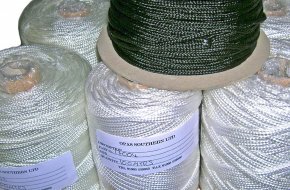 Cordage has a place in a huge range of manufactured products and OPAS hold reel stocks for immediate despatch of both braided polyamide and polypropolene. Click here for our cord lacing section where you can browse our large range of specialist cord lacing fittings, assemblies and tools. White polyamide braided flag cord; 200m reel of 3mm diameter cord. White polyamide braided flag cord; 100m reel of 5mm diameter cord. Black polyamide braided cord; 100m reel of 4mm diameter cord.